My dentist tells me I need a root canal, what does that mean? Often patients are extremely nervous when they hear they have to get a root canal. There’s really no reason to be. It really is a painless procedure and can help save your tooth. Why would you need root canal therapy (RCT)? There is a large cavity in your tooth that involves the nerves inside of the tooth. This is often associated with pain/toothache. There is an infection around the root of your tooth which can cause swelling. Patients may or may not feel any pain. There is so much tooth structure missing from your tooth that you need a post placed inside your root space to retain the filling material. The tooth previously had a root canal but is now reinfected. The root canal will need to be redone or retreated. What is involved in the root canal procedure? 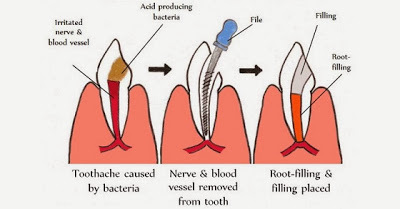 The main purpose of root canal therapy is to disinfect the entire tooth (including the roots) of bacteria. This will essentially also render the tooth non-vital and it will no longer have sensation. The dentist will get you numb first with novocaine A small access hole will be made through the top of the tooth. The dentist will clean the inside of the entire tooth and pack a sterile rubber based filling material inside the roots. The access hole will be patched with a permanent or temporary filling material depending on the case It is highly recommended to have a crown placed on the tooth shortly after the root canal to protect the tooth from cracking.